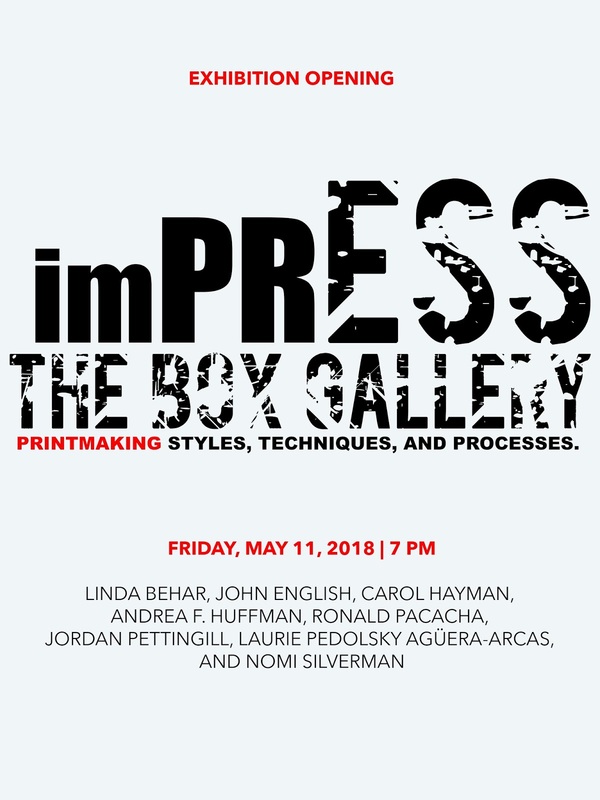 Impress Exhibition Opens with a reception on May 11, 2018 at The Box Gallery. IMPRESS: Printmaking styles, techniques, and processes. West Palm Beach- The Box Gallery presents IMPRESS: Printmaking styles, techniques, and processes. 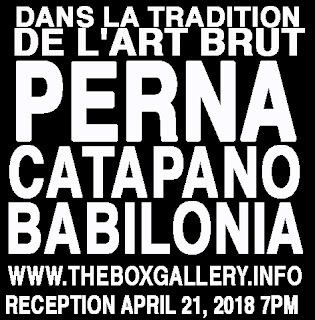 An exhibition of works by 8 contemporary artists who’s work explores the varieties of techniques of the over 3000 year old process of making impressions. The work created by Linda Behar, John English, Carol Hayman, Andrea F. Huffman, Ronald Pacacha, Jordan Pettingill, Laurie Pedolsky Agüera-Arcas, and Nomi Silverman exemplify the approaches and the techniques in printmaking that have remain relatively intact throughout the ages. Impress opens with a reception on Friday, May 11, 2018 at 7 p.m. at The Box Gallery located at 811 Belvedere Road in West Palm Beach, Florida, and continues through June 1, 2018. 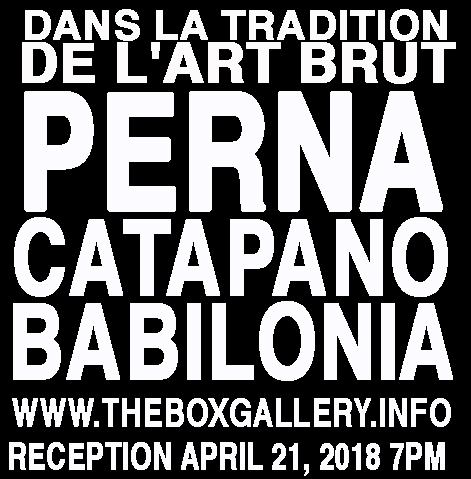 In addition The Box Gallery will host two presentations at The Boynton Beach Art District, 410 West Industrial Ave., Boynton Beach, Florida 33426, at the art studios of printmakers Ronald Pacacha (monoprinting) and Jordan Pettingill (silk screen) on Saturday, May 12, 2018. 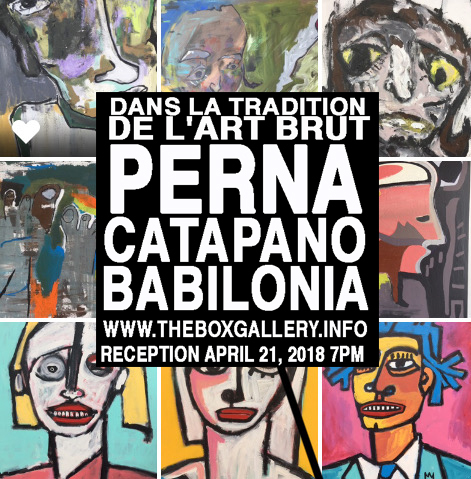 Robert Catapano at the Box Gallery: Dans la tradition de l'art brut: The work of Robert Catapano, Nelson Babilonia, and Eric Perna. 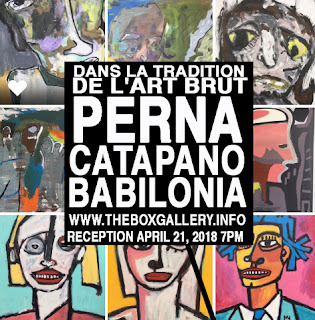 "The concept of Art Brut stems from the French painter Jean Dubuffet who, from 1945, assembled a collection of objects created by the inmates of various psychiatric hospitals and prisons—solitary or outcast persons. In their creations, he saw "an entirely pure, raw artistic operation that the creator fully reinvents in all its phases, as spurred uniquely by his own impulses." 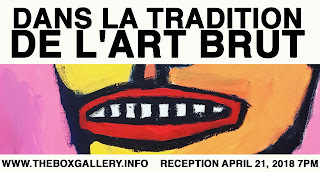 The idea of Art Brut is thus based on certain social characteristics and aesthetic peculiarities." - Collection de l'art brut. The work of Robert Catapano, Nelson Babilonia, and Eric Perna. 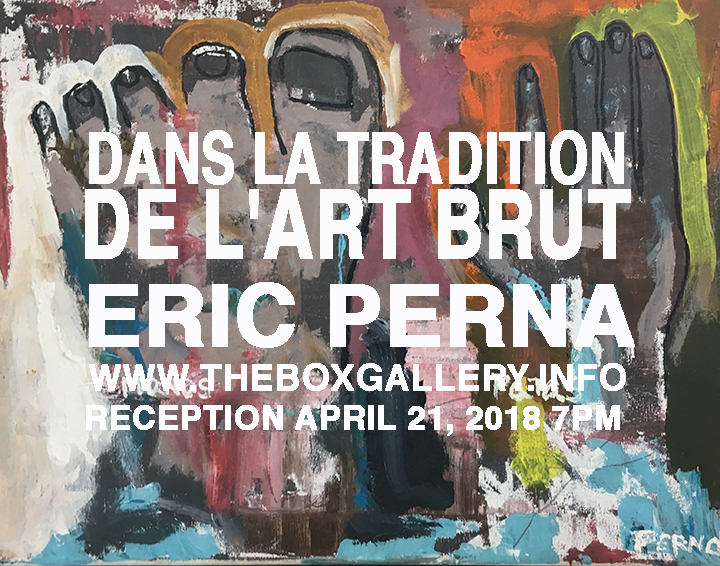 VIP Reception April 21, 2018, 7 pm. reception at The Box Gallery. 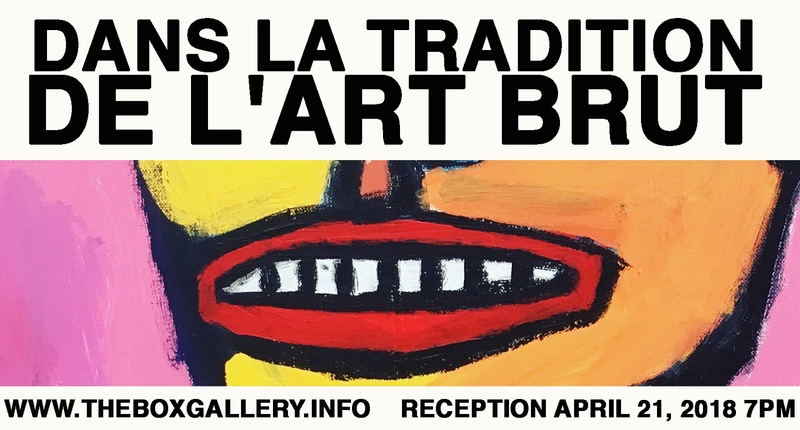 Dans la tradition de l'art brut exhibition, featuring the works of contemporary artists: Robert Catapano, Nelson Babilonia, and Eric Perna. In coining the term, Dubuffet switched the dysfunctional focus away from the mad inmates and towards the critics and galleries. 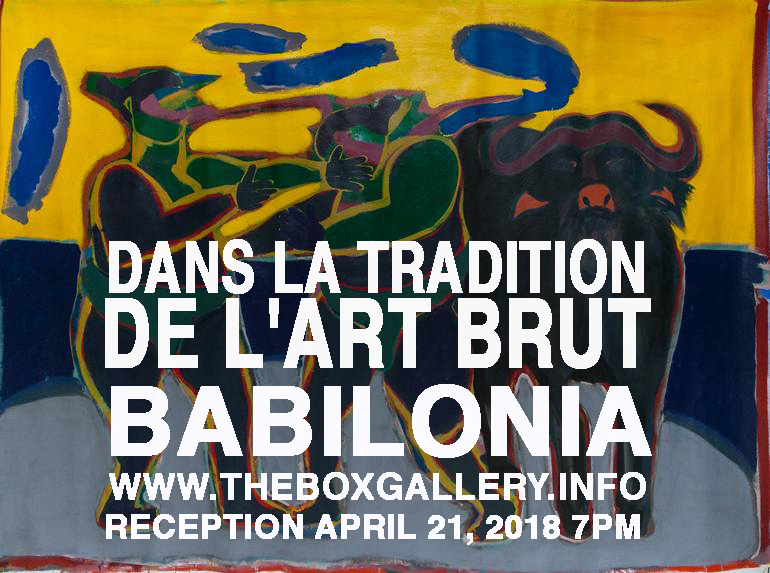 His 1947 Art Brut manifesto declared that “We understand by this term works produced by persons unscathed by artistic culture, where mimicry plays little or no part (contrary to the activities of intellectuals). These artists derive everything - subjects, choice of materials, means of transposition, rhythms, styles of writing - from their own depths, and not from the conventions of classical or fashionable art." The Box Gallery is located at 811 Belvedere Road, West Palm Beach, Florida 33405. Eric Perna at the Box Gallery: Dans la tradition de l'art brut:The work of Robert Catapano, Nelson Babilonia, and Eric Perna. 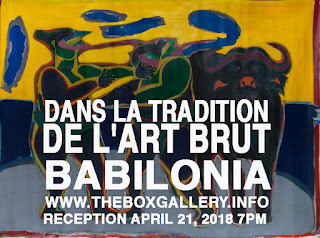 Nelson Babilonia at the Box Gallery: Dans la tradition de l'art brut:The work of Robert Catapano, Nelson Babilonia, and Eric Perna. The Boynton Beach Art District! One of Palm Beach County's Best Multimedia Festivals! The 7th Annual ActivistArtistA KeroWACKED Fest. Boynton Beach--The trendsetting hipster hangout, the Boynton Beach Art District is leading the pack again this summer starting with their kick offspring festival the 7th Annual KeroWACKED Festival. The brainchild of artist Rolando Chang Barrero who loves the literature of beat generation and it’s cast of influencers says this years theme is “women of the beat.” The homages are part of highlighting the underrepresented women writers, Joyce Johnson, Diane Di Prima, Brenda Frazer, Joan Vollmer, Carolyn Cassady and Elise Cowen, who are too often are overlooked by the fame of festival's namesake Jack Kerouac and the other beat generation's leading literary males counterparts; Allen Ginsberg, William Burroughs, and Neal Cassady. The festival which began in the spring of 2012 has a consistently rounded up artists, musicians, poets and other creatives to provide the community with a day-long fun-filled day. This year’s roundup of talent includes the following…. Resident artists: Rolando Chang Barrero, Nancy Bivins-Edwards, Tobius Kinte, Diane Slobotkin, Dianett Doyle, James Russo, Chris Bivins, Michael Kupillas, Zach Purdo, Heather Leake, Nicole Galluccio, Christine Sylvain and Jordan Pettingill. Bands: Altered Roots, ReMerge, Grace Roots Xotic Yeyo, Mood Swing, The Coven, and Silky Milky Sugar.